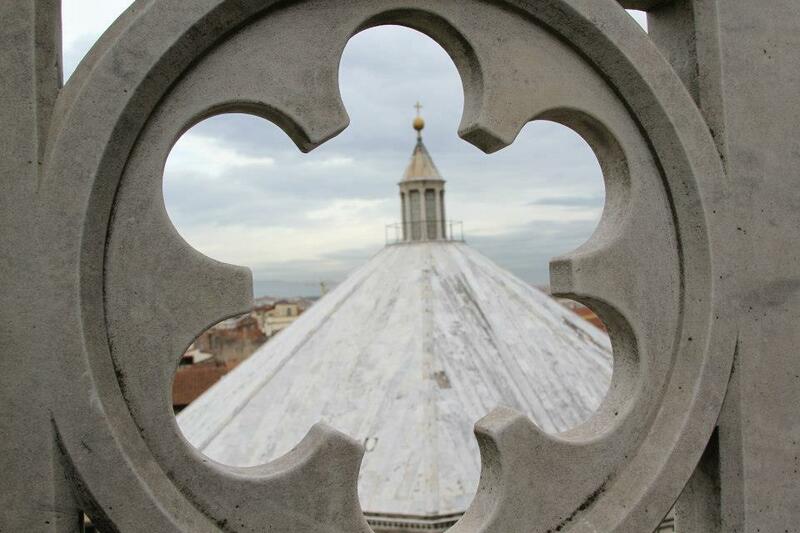 The roof of the Baptistery from the roof of the Duomo Cathedral. 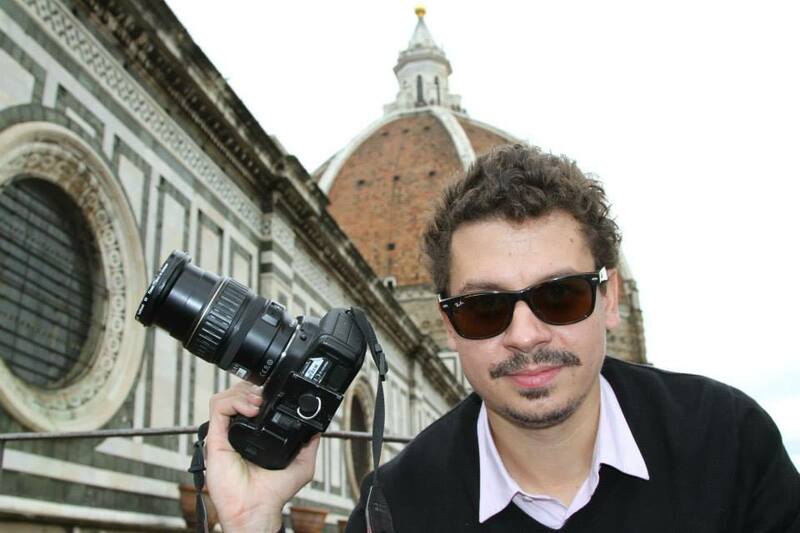 Invited by the Museo dell’Opera del Duomo (OPA)to join their interdisciplinary team of researchers working to establish a chronology of construction for the Florence Baptistery of St. Giovanni (John). The evolution of the site from its Roman origins upwards is rather mysterious. Significant research has been done by dedicated scholars, but they’ve no way to correlate that information altogether to start making sense of it. Enter CISA3 with our concept of layered realities of data draped on a digital scaffold. 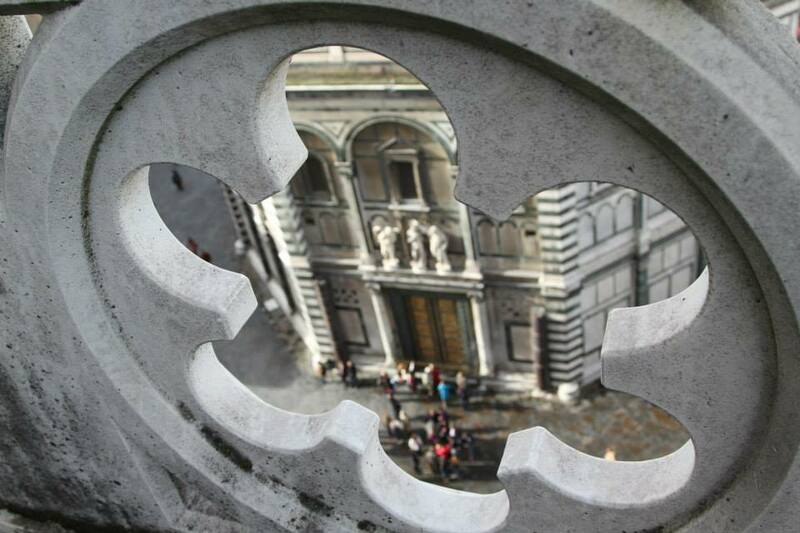 With little to no warning (because that’s how access to these sites rolls in Italy), we were given permission to image the roof of the Baptistery from the front face of the Duomo. Pretty cool, huh? We even got to cheat and rather than climb up with all of the equipment, took the construction elevator for the on-going work at the back of the Duomo and walked along the top mini-balconets that encircle it to get round to the front face. This area seems to be currently off-limits to tourists, but there were enough roped off bits, that it does seem to allow for some kind of public traffic everyonce awhile. However, much to the consternation of the tourists who could see us from the neighboring Campanile tower, the roof of the Duomo was off-limits to everyone but us that day. Again with a person-size restriction, and with a very marrow time-frame (both in terms of the predicted rainstorm about to arrive and the access allotment of people-time–remember, a security person or official project architect wanders round with us the whole time for the site’s safety (and they are always super nice and lovely)). 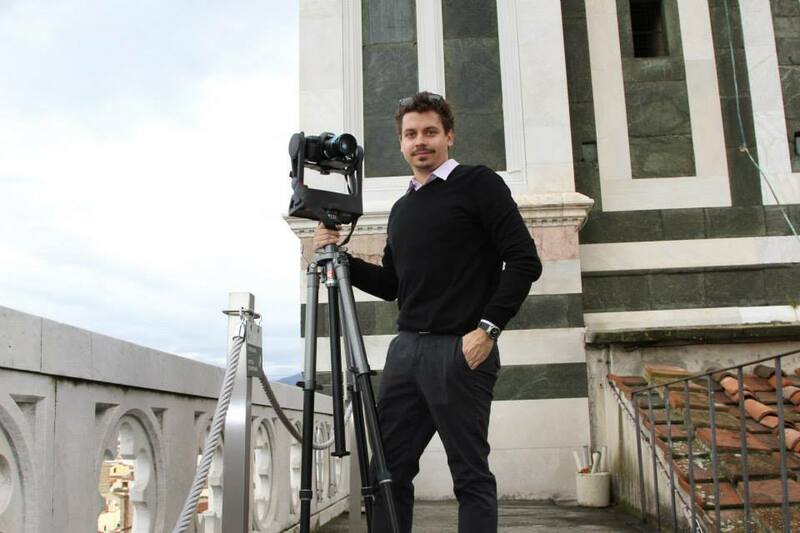 So DV, Vid Petrovic, and myself were sent to spend a lovely morning on the Duomo’s front face, scanning and photographing the neighboring Baptistery roof from our perch. 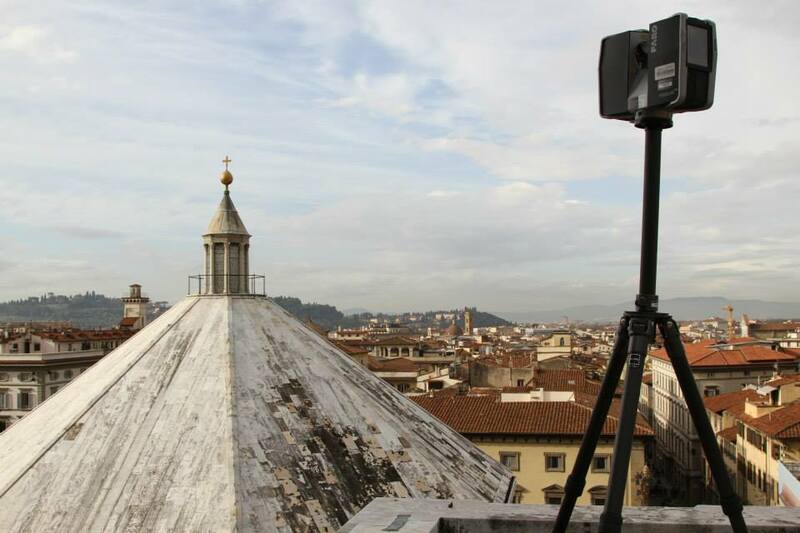 The Faro Focus 3D Scanner and the roof of the Baptistery. 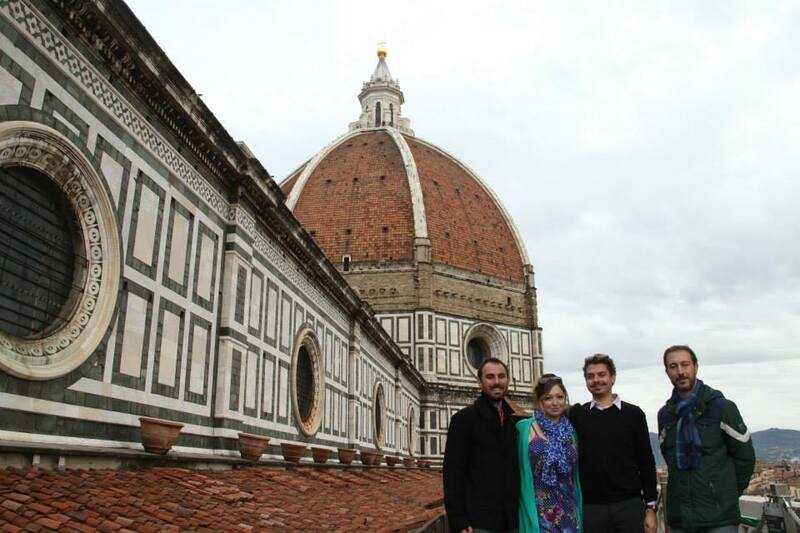 DV, Ashley M. Richter, Vid Petrovic, and our fabulous OPA supervisor after imaging the Baptistery roof from the Duomo. Tagged archaeology, Architecture, art, Ashley M. Richter, Baptistery, Baptistery of San Giovanni, Baptistery of St. Giovanni, Baptistery of St. John, Baptistery roof, Battistero, Center of Interdisciplinary Science for Art Architecture and Archaeology, CISA3, computer science, Cultural Heritage, Cultural Heritage Diagnostics, cyberarchaeology, Digital, digital archaeology, Duomo Cathedral, engineering, Florence, Italy, laser scanning, Point Clouds, structure from motion, technology, University of California San Diego, Vid Petrovic, visualizationBookmark the permalink.